“Doula UK CIC” is committed to ensuring that your privacy is protected. Should we ask you to provide certain information by which you can be identified when using this website, then you can be assured that it will only be used in accordance with this privacy statement. 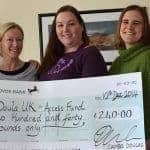 “Doula UK CIC” may change this policy from time to time by updating this page. You should check this page from time to time to ensure that you are happy with any changes. This policy was updated on 4th June 2018. Overall, cookies help us provide you with a better website, by enabling us to monitor which pages you find useful and which you do not. A cookie in no way gives us access to your computer or any information about you, other than the data you choose to share with us. No cookies are set by other companies or organisations other than Google (for our analytics purposes) and social networking sites may also monitor access if you interact with the site (eg using a Facebook like button). You may request details of personal information which we hold about you, for free, under the Data Protection Act 2018 and the General Data Protection Act 2018.